The 22nd SEDE Conference is interested in gathering researchers and professionals in the domains of Software Engineering and Data Engineering to present and discuss high-quality research results and outcomes in their fields. 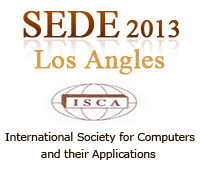 SEDE 2013 aims at facilitating cross-fertilization of ideas in Software and Data Engineering, and hence especially encourages high-quality research integrating both domains. Recent trends in computing have shown a growing need for the development of distributed, decentralized computing systems that are adaptive. Hence we encourage research papers dealing with the process definition, requirements specification, modeling, design, and management of distributed, adaptive, data-intensive systems. Applied case studies will report on exemplary solutions deployed in industries such as aerospace, telecommunications, and military.